No position on Michigan's depth chart caused more consternation preseason than the defensive tackle position. Options consisted of: a middling senior (Campbell), OL convert (Washington), DE convert (black), redshirt sophomore who hadn't seen any playing time (Richard Ash), or an oversized true freshman (Ondre Pipkins). Because [Washington]'s going to be a starter, the coaches have been pumping him up throughout camp, praising his abilities. At 6'4", 300 lbs, he won't be much of a slasher, but he may be able to hold his ground much like Campbell. As a position switch, leverage and technique remain a concern, but if he can stay sound in the middle, Michigan should remain stout against the run and rely on blitzes and the defensive ends for pass rush. Six games later, Michigan's defensive tackles may be the second-best unit on the defense. Quinton Washington is a runaway candidate for most-improved player on Michigan's roster and perhaps in the conference. Washington's (and Will Campbell's) contributions have been a little harder to quantify, though: through six games, Washington has marked 8 solo tackles, 10 assists, and 2 TFLs. His totals last year? Nine games played, one tackle. Obviously playing time is a factor here. Washington was backing up ironman Mike Martin (who, for reference, ended the season with 20 solo tackles, 44 assists, and 6 TFLs; Washington won't match those numbers, but the coaches have asked hi to play a different style of football), but even in his spot duty, Washington was a liability. Now, he's proven concerns about his technique unfounded and has been exactly what Michigan needs: a strong body in the middle of the formation that can get push against guards and hold up to double teams, allowing linebackers to make plays. The other pleasant surprise this year has been the development of Will Campbell into a similar immovable force on the defensive line. Campbell's 2012 stat line is similar to Washington's: 9 solo tackles, 9 assists, 1 TFL, 1 sack (he tallied 5 tackles, 9 assists, 2.5 TFLs, and 2 sacks in 2011). Like Washington, Campbell will never be the slashing nose tackle/3-tech that Mike Martin was. What he has done is become a reliable interior lineman who holds up to double teams and allowed those the linebackers behind him to fill the gaps. One of the reasons Michigan's defensive line has been so successful is because of Greg Mattison's reliance on slants. Campbell and Washington have both proven to have good first steps playside on slants enabling them to cut into the backfield. These slants have also produced simplified reads for the linebackers to clean up plays on the backside. The defensive tackle position has seen a lot of rotation this season. In nickel packages/passing situations, Craig Roh and Jibreel Black have assumed the DT positions. And to give the starters a blow, Ondre Pipkins has been rotating onto the field with regularity, especially in the last few games. Pipkins has returned middling results, occasionally showing the ability to hold up to double teams and get push off the ball, but also being blown back on various run plays. Defensive tackles take time to develop and Pipkins will be a project. This unit projects to improve as the season progresses. Hoke and Mattison are magicians, of this, I'm sure. As Washington and Campbell see more snaps, their understanding of the defense and what an opposing offense is trying to do will only increase. With similar development from Pipkins and Richard Ash (maybe), the coaching staff will be looking toward the future with the defensive tackles. It's hard finding recent pictures of Craig Roh, so instead, you get him celebrating at the Sugar Bowl with this average+ girl. There's a reason Roh isn't an SEO-heavy player, though: he's had a fairly pedestrian year. That doesn't mean he's had a bad year. Six games into the season, Roh has 6 tackles, 13, assists, 2.5 TFLs, and 2 sacks (important note: he already has as many sacks as he did in all of 2011). That's what Michigan's coaching staff has asked of him: replace stalwart ironman Ryan Van Bergen at strongside defensive end. Michigan doesn't need Roh to make plays. They need him to be stout against the run, disciplined in contain, and make the tackles that come in his direction. Roh has met those expectations with flying colors. Making the move from weakside defensive end, Roh needed to add weight/strength and concern himself more with taking on double teams than getting to the quarterback, something he was never very good at anyway. He's started making noise in the box score in the past few games, but that you haven't been angry at him or even noticed him much this year is the highest praise of his game. Opposite Roh at the weakside defensive end spot has been a platoon of Jibreel Black and Frank Clark. Black has been underwhelming. After bulking up for a potential move to defensive tackle, Black's speed has suffered. For the year, he only has 4 solo tackles, 3 assists, 2 TFLs, and a PBU (more about later). Clark has shown both more upside and more production this season: 5 solo tackles, 4 assists, 3 TFLs, and 3 PBUs. Clark does have the benefit of playing only defensive end as opposed to Black who slides over to defensive tackle on nickel sets, but his speed and ability to get to the QB trump Black's while Clark's backside contain responsibilities have been much improved over last year. There's a whole host of backups at the defensive end positions due to Michigan's multiple defensive sets. Freshman Mario Ojemudia has delivered on the hype that he received in the preseason by charting 7 solo tackles, 3 assists, 1.5 TFLs, 1 sack, and a fumble recovery. His pass rush moves may be the most dynamic on the team, but he lacks the size and patience to be an every-down WDE. Michigan's other pass-rush DE has been Brennan Beyer, who has been relatively disappointing as a pass-rush specialist. Roh's backups basically don't exist; when he's off the field, it's usually because Michigan has its nickel package on the field. The wildcard WDE this season has been Cam Gordon, the converted WR converted safety converted linebacker. Gordon presents zone blitzing flexibility in passing situations for Mattison. The most impressive aspect of the defensive ends' game this year has been breaking up passes at the line of scrimmage. Of the team's 11 PBUs this season, defensive ends are responsible for 5 of them (Clark 3, Gordon, 1, Black 1). The coaching staff have clearly made this a coaching point, especially on short yardage passing plays. The defensive ends have been able to recognize short drops by the quarterback and get in passing lanes all season. Mattison and Hoke: Wizards, I say. Craig Roh needs to stay healthy for this defense to maintain its current production. He may not be the best player on the defense, but he's certainly the most important, if only because Michigan doesn't have anyone to fill in for his production/minutes. Black will probably be moved to DT permanently and play sparingly for the rest of the year with the emergence of Clark as Michigan's best WDE and Omejudia's impressive freshman campaign. Ryan finished 2011 with 20 tackles, 17 assists, 11 TFLs, and 3 sacks. His season wasn't without hiccups though. Against MSU, he got confused on a zone vs man coverage scheme negating a great blitz by Michigan, and he showed frequent issues early in the season maintaining the edge against the run. As the year progressed, those freshman issues worked themselves out and Ryan proved to be one of the most consistent impact performers on the defense. Expect Ryan to maintain or slightly improve his numbers from last year while almost eliminating those mental mistakes. If he experiences the kind of freshman-to-sophomore year spike that you generally see, Ryan should garner All-Conference consideration by the season's end. It's not often that projecting a redshirt sophomore as an All-Conference performer before the season is short selling him, but that's what has happened with Ryan who is the defense's best player and perhaps the best strongside linebacker in the conference. Ryan is the team's leading tackler with 26 solo tackles (16 assists) and leads the team in TFLs and sacks with 7.5 and 2.5 respectively. Oh, he also has 3 PBUs and a forced fumble as well. Ryan has seemingly been everywhere on the field, part of which is scheme related (Mattison likes blitzing linebackers a lot) and part of which is just always playing disciplined football. Ryan has been Michigan's best player on both sides of the ball and has helped solidify a position with shaky depth. the strongest aspect of Demens' game is coming downhill on blitzes and stuffing the run. I don't think he'll ever be an elite coverage linebacker, which limits Mattison's blitzing schemes a bit, but not enough to be a hindrance. This year, expect the same from Demens: stout against the run, good at wrapping up tackles, and a suspect cover guy. It wouldn't surprise me to see Demens pulled off the field occasionally on nickel packages to get a more fleet-of-foot linebacker on the field. Otherwise, Demens is the defensive anchor in the front seven. Demens has been better against the run this year and has benefitted from a change in defensive line philosophy. Last year, Mike Martin's task was to penetrate and get into the backfield, leaving offensive guards able to release to the second level and block Demens who struggles getting off blocks and avoiding linemen. This year, with space eaters Washington and Campbell at the DT positions, Demens has been clear to play aggressively downhill and fill run gaps properly. I still find his coverage skills suspect (which may sound odd coming off a great interception in the Illinois game). He's been able to cover tight ends on seem routes, but he still hasn't been tested horizontally. Running vertically with tight ends should be a given for middle linebackers. Great coverage backers have better lateral movement, but those are minor complaints and Demens hasn't been victimized laterally this season (he also hasn't been tested). On the weakside, Desmond Morgan has returned for another season. Without prototypical WLB physique, Morgan never projected to be a star and appears to be "just a guy" despite being the team's third-leading tackler (16 solo tackles, 17 assists, and 4 TFLs). Morgan plays reliably and is rarely--if ever--out of position, but he's the kind of guy that you're glad is on the field only when he makes a backside contain or tackle. Mattison may not be dialing up many blitzes for him, but like Roh, his anonymity is a testament to sure technique and disciplined play. The backups are all over the map and mostly freshmen. Cam Gordon has moved to a nickel defensive end spot, leaving freshmen Joe Bolden, James Ross, and Royce Jenkins-Stone to fill in at various linebacker positions. Ross and Bolden have seen the most time with Jenkins-Stone playing mostly on special teams. Ross has shown flashes against weak competition as has Bolden, but neither has seen many meaningful snaps against quality opponents. With Demens looking improved, Ryan the unquestioned breakout star of the defense, and Morgan eliminating the freshman mistakes from his game, Michigan's front seven has been a terror for opposing offenses. After Alabama (talent) and Air Force (scheme), no offense has faired well against Michigan's run defense: UMa$$ (3.1 YPC), Notre Dame (3.0 YPC), Purdue (2.2 YPC), and Illinois (2.8 YPC). 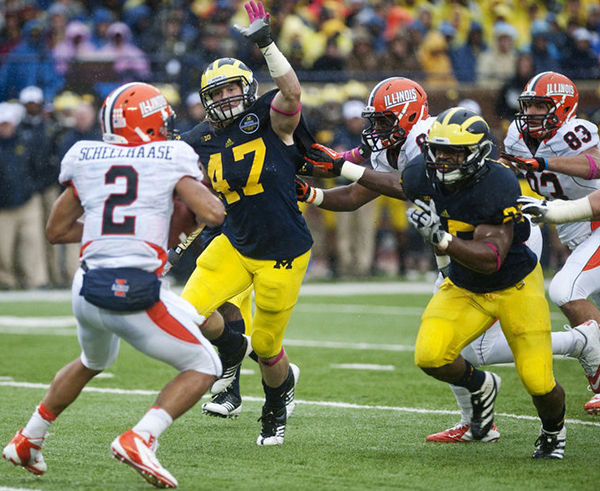 Expect more innovative blitzes from Mattison that utilize the speed of Ryan and Demens. And as the season wears on, the freshmen linebackers should start seeing more rotation. When Blake Countess was injured against Alabama, things once again looked grim for Michigan's secondary. JT Floyd is a competent cornerback but not one that can compete with elite receivers and Courtney Avery is best as a nickelback. In Countess' stead, sophomore Raymon Taylor has stepped in admirably. JT Floyd hasn't shown much improvement over last year's performance, but he remains a solid option. Floyd excels in the film room, which prepares him to read hitch routes and attack offenses looking for easy completions. He still can't defend elite receivers and double moves are probably still terrifying, but like Taylor, Mattison hasn't left Floyd out on an island much this year. Courtney Avery wasn't able to grab the starting spot vacated after the Countess injury but has continued his reign as Michigan's best least important player. Avery comes onto the field in passing situations and is never thrown at, which means he's probably doing something right. It also means his stat line is pretty bare (7 solo tackles, 3 assists, 1.5 TFLs). Michigan's backup corners have seen almost no playing time this season. More injuries to the cornerbacks could derail this defense. Mattison's defenses require good corners that can play solid man coverage in order for the linebackers to blitz as much as they do. Taylor will continue his development and by the season's end, expect to be as excited about his second year as a starter as you were about Countess. Floyd will be dependable, as will Avery. Don't expect to see any backups unless it's in garbage time. The most underrated aspect of Michigan's defense this year is Jordan Kovacs' placement on the leading tacklers list: fourth. Kovacs has 22 solo tackles, 11 assists, and 2 TFLs. Continuing that pace would put him at only 66% of his 2011 totals (61 solo tackles, 55 assists, 8.5 TFLs, 1 sack). Kovacs has not gotten worse; the defensive front seven has improved so dramatically that there's no need for the team's strong safety to be the team's leading tackler. Thomas Gordon has reprised his role as a dependable free safety. He's proven adept in coverage and is a sure tackler. Michigan hasn't allowed a play longer than 40 yards this season. Honestly, the only reason the safeties are receiving an A instead of an A+ is because I don't feel like I've seen them do much. Gordon has 23 solo tackles (this seems high), 11 assists, and 2 TFLs, which puts him about on track to reach his 2011 stats. The best thing any backup done this season is Josh Furman's hilarious punt coverage against Illinois. Still. Cannot. Stop. Laughing. More of the same. Michigan's biggest concern at this position is next year's starters. Kovacs and Gordon appear to be on the field for every play. With the loss of Kovacs, finding a strong safety as good as #32 will be difficult to do, especially with Michigan's current roster. Um, probably Jibreel Black. He has been replaced by Frank Clark. Also, the rest of the defense has been better than expected. With Washington coming back next year and Pipkins being as impressive as a true freshman DT can be, any chance that Black moves outside to strong DE next year? I know Michigan has a couple of good SDEs redshirting this year but Black inside has just been a disaster (worst [only bad] move of Hoke's career so far). Outside he could offer some pass rushing skills but since he's a strong guy (strong enough to have been moved inside despite being too small) he'd hold up well against the run. When Keith Heitzman goes in, is he playing DT or spelling Roh at SDE?